my moisturizing hair conditioner is deliciously hydrating. why not give your dry hair a drink? I say you can never get too much of a good thing. so say "hello" to a deep dousing of lush hydration with my rich formula. I’ve got moisturizers and a fusion of Hawaiian coconut and orchid. drink up and replenish much needed moisture. my hair conditioner will reunite you with manageable, silky, smooth hair. So I have a bit of a thing for coconut scented beauty products. 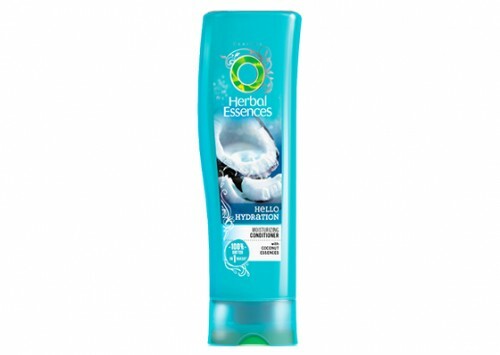 This Herbal Essence Hello Hydration Conditioner is no exception. The bright packaging is pretty and the design is easy to use. The bottle stands with the cap at the bottom which allows for little-to-no wastage of product. It smells divine and my husband comments on how nice my hair smells when I use this. Paired with the Hello Hydration Shampoo, it makes my hair feel clean, fresh and super soft. Delicious coconutty-scented light-blue conditioner... with a nice thick consistency. Love using this together with it’s just as yummy shampoo pair. My hair feels smooth and hydrated after using it. The beautiful subtle scent also tends to linger for a bit, not only in the shower, but also on your hair. After blow-drying, my long hair feels soft and smooth to the touch, with a nice bit of volume (so not dead straight like a doll). Definitely worth buying for those who enjoys a nice scented conditioner, and doesn’t mind it’s colour. I absolutely love the smell of this conditioner. It's a very fresh coconut scent that's not to over powering and the scent lingers in my hair for most of the day. I found this product (paired with the herbal essence hello hydration shampoo) to clean my hair very well leaving it light and fresh feeling. As an added bonus it give me get volume a well. The only downside I have found is that I get a lot of flyaway strands sticking. I picked this up on special at Countdown for only $3. The packaging picture has changed to a forest image which is cool. Very eye catching. Bright blue bottle and a good 300ml size. It sits upside down on the lid so is easy to dispense. The formula is lovely and thick. Exactly what a conditioner should be. It spreads easily and makes your hair feel like silk. The smell is amazing! Just like coconuts and it lingers in my hair for ages. It leaves my hair sooooo soft and shiny! I love the results after using this. I have not used the matching shampoo so will purchase that next week.I think this is great for anyone with dry hair. I will definately repurchase this. Saw this on my weekly grocery shop and thought I would give it a try. My hair is dry from straightening and colouring. Doesn't help that my hair is thick and curly as well. This conditioner bottle sits on itself. Its very easy to get product out of it. The consistency of this is smooth creamy light blue colour. Smells like vanilla coconut. After Shampooing my hair I put this conditioner through my hair. It feels smooth and soft like silk in the water. After washing it off my hair is easier to brush. The scent of it lingers for a while after it. I like pairing my shampoo and conditioner. I believe it is priced fairly. I like to wash my hair every second day with this. My hair feels soft and not as dry as it usually is. Its been great to use for my whole family. I most likely would purchase this one again. Hydration is exactly what I need with my very dry, over-processed, thick and frizz-prone hair. I used this conditioner with it’s partner shampoo. This is a thick and creamy, opaque blue conditioner. It’s has a very sweet botanical coconut fragrance, which is pretty much the same as the shampoo, just not as strong. The bottle is opaque and otherwise identical to the translucent shampoo bottle. They’re a nice slender shape, which is a practicality point; easy to pick up and hold, and shouldn’t slip. I do find this to be a powerfully hydrating conditioner (& shampoo), it smoothes, detangles and softens. For such an affordable option, I’m quite impressed with the efforts of this conditioner (& shampoo.) They certainly deliver hydration to the most dry and damaged of hairs. Combining this conditioner with the shampoo is total bliss to my hair. With the constant straightening and the extreme heat temperature from the sun this my favourite piece of hair paradise. It smells devine and always leave my hair hydrated and do smooth. This conditioner smells so yummy, and makes my hair feel like light and soft, i am a big lover of coconut, but i dont like that too heavy coconut smell and this is just right.